NutraBio Athlete, Julio Arce from New Jersey dominated the TUF Gym Octagon on August 8th, 2017!! This fight was live on Dana White’s Contender Series 5 held in Las Vegas, Nevada. Arce’s main card bout against Petties resulted in an astonishing TKO in the middle of the second round! Julio overpowered him with a barrage of punches. Knocked him silly. At one point Petties collapsed while stepping forward. He was unconscious for a moment, then I think Arce’s next punch woke him back up, followed by another that knocked hi back out. Now, I don’t usually rip fighters like this, but Petties liked to drop his hands, stick his chin out and taunt Arce. A stupid strategy especially when you don’t know your opponent very well. Arce schooled him on that point. Congrats Julio!!!! 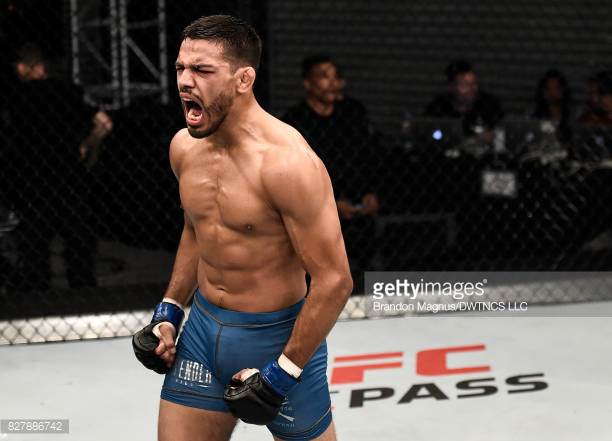 This entry was posted in Team NutraBio and tagged Athlete, Contender series, Julio Arce, Knock Out, MMA, NutraBio, Professional, TKO, Team NutraBio, Tiger Schulmann, UFC by Christina Mayor. Bookmark the permalink.